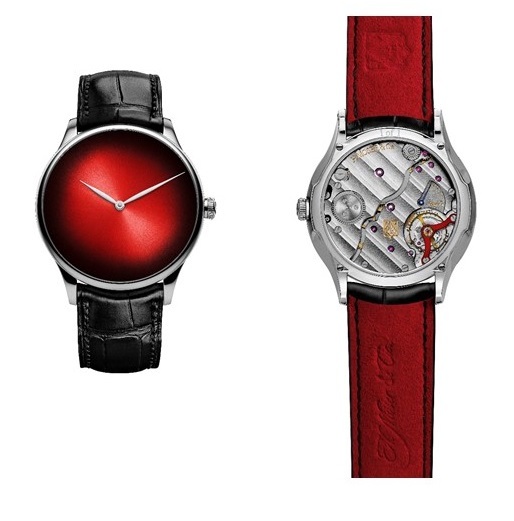 H. Moser & Cie. joins the fight against Duchenne Muscular Dystrophy by participating for the second time in the Only Watch Charity Auction organised by the Monegasque Association against Muscular Dystrophy through the Only Watch campaign. For this occasion, the Manufacture has created a unique piece, the Venturer Concept Only Watch. A minimalist ode to red, it is a reminder of the importance of focusing on the essential. On November 11th, 2017, Geneva will host the seventh Only Watch charity auction, with proceeds donated to research into Duchenne Muscular Dystrophy. H. Moser & Cie. is taking part in this campaign once more with the donation of a unique piece, the Venturer Concept Only Watch. A symbol of life and of renewal, in all its striking force, red takes centre stage in this watch, which showcases a vibrant red fumé dial. This red is beautifully offset by the white finish of the hour and minute hands, in reference to the colours of the flag of Monaco. Part of the H. Moser & Cie. series of Concept watches, the Venturer Concept Only Watch is stripped of any logo or indices. This minimalist approach puts the product itself firmly in the spotlight, abstracted from any marketing or branding concerns, as a reminder that behind every logo lies not just traditional expertise but, most importantly, men and women. It creates a distinct identity which returns to the very roots of watchmaking, when dials did not bear any signature. A watch with an authenticity and purity which prove that only the essential matters. Faced with illness, especially when it affects a child, priorities come into sharp focus, centring on what is important. Everything else becomes futile. Inside the white gold case of the Venturer Concept Only Watch, the HMC 327 hand-wound movement guarantees a minimum power reserve of 3 days. Finally, visible through the sapphire case back, the balance bridge features a striking red to match the dial of the Venturer Concept Only Watch. An original touch in honour of this exceptional charity event. The Venturer Concept Only Watch will be on display in Monaco during the Monaco Yacht Show, which takes place between September 27th and 30th, 2017. The Only Watch 2017 collection will then go on tour, taking in Singapore, Bangkok, Dubai, Istanbul, Hong Kong, Taipei, Tokyo, New York, Los Angeles and, finally, Geneva, from November 9th to 11th, 2017. Engraved on the movement side of the case with "1 of 1"
18-carat white gold pin buckle engraved with the Moser logo.